With all the flavor of the season, our farm-fresh dinner will soon be your fall favorite. 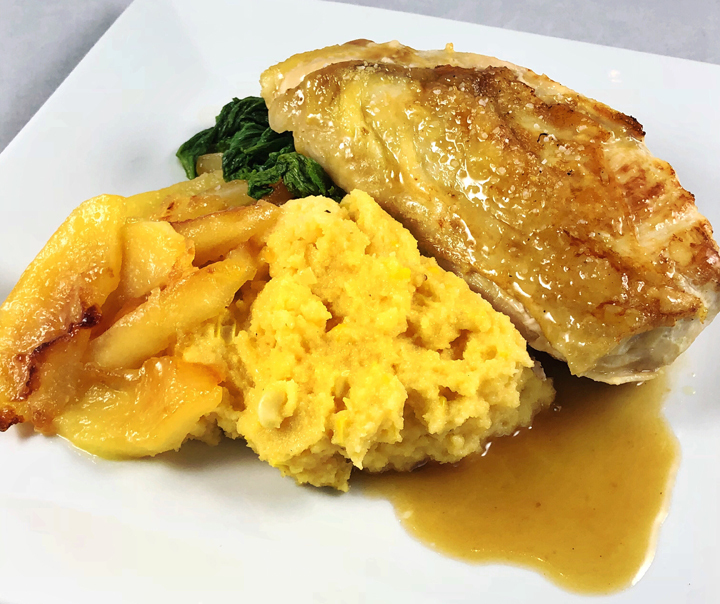 Oven roasted, crispy skin chicken breasts are served with a cider lemon butter sauce alongside sweet sautéed apples, creamy cheddar polenta with fresh corn, and tangy mustard greens. With these easy to make recipes, you can pick your favorites or prepare them all. Preheat a large cast iron skillet over medium-high heat, until the surface of the pan is very hot. With paper towels, dry the chicken breasts then season well with salt and pepper. Add the oil to the pan and heat until the oil is just moving in ripples. Place the chicken, skin side down, in the pan and cook until the skin is golden about 4 minutes. Turn the chicken breasts skin side up, add a tablespoon of butter and place the skillet in the oven. Cook for 15-20 minutes until an instant-read thermometer registers 165˚F when inserted into the thickest part of the chicken. Transfer the chicken to a plate and cover with foil to keep warm. Melt the butter in a large nonstick sauté pan over medium-high heat. Add the apples, syrup, lemon juice and salt, and sauté until tender and the edges are lightly browned about 9 minutes. Cover and serve warm. Sauté the fresh corn over medium heat in 1 tablespoon butter for 7-8 minutes, remove and set aside. Follow the directions on the packaging of polenta using the chicken stock for the liquid. When cooked, add the corn, cheddar cheese, 2 tablespoons remaining butter and cream to the polenta; stirring to combine to a smooth consistency. Serve immediately. In a large sauté pan with straight sides, heat the oil on medium heat. Add the garlic to the hot oil and sauté for 30 seconds. Add the mustard greens, season with salt and pepper, and sauté while tossing to until they wilt. Add the chicken stock and heat to a simmer. Lower the heat and cook for about 5 minutes more until the stock as almost evaporated. Serve warm.